Provide long-lasting power for your Canon EOS C300 or C500 camera and D-Tap power for select accessories with this Dionic XT90 Battery Kit with Tandem-70 Charger from B&H. 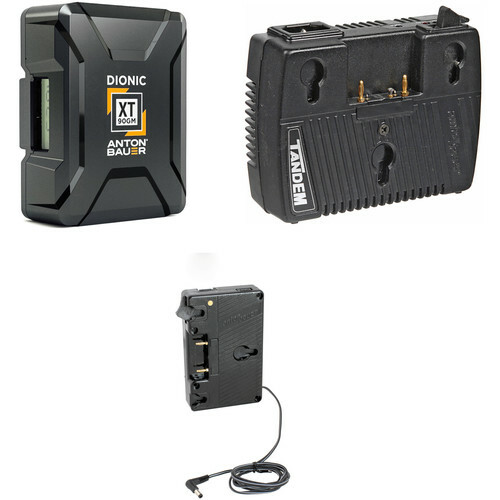 This kit includes one Gold mount Dionic XT90 battery, a Tandem-70 on-camera AC adapter/charger, and a dedicated QRC-CA940 C300/C500 adapter plate. Use the Anton Bauer Dionic XT90 Gold Mount Battery to power your Gold mount camera or other pro video gear. The lightweight lithium-ion chemistry can provide up to 12 amps of current on a continuous draw and support peaks of up to 20 amps for two seconds. At the side of the chassis, a backlit LCD has battery capacity information so you know when you'll have to swap out one battery for a fresh one. Using the P-Tap and USB ports, you can power essential accessories on your rig or other small electronics. The Anton Bauer QRC-CA940 Gold Mount Battery Plate powers the canon EOS C300 or C500 via a DC connector. It also features three P-Tap outputs for powering monitors, recorders, and other accessories. All four outputs can work at the same time, thus simplifying on-set battery management and reducing downtime when changing batteries. The plate mounts rigs by an optional Anton Bauer Matrix cheese plate, or you can put it in a pouch and hang the pouch around your tripod. Box Dimensions (LxWxH) 7.4 x 4.6 x 3.5"
Box Dimensions (LxWxH) 7.4 x 3.7 x 2.2"